Completing a bike safety check can help you to diagnose any maintenance issues before they can affect you whilst you’re out on the road. Depending on how much time you have you may want to perform a comprehensive M-Check for 5-10 minutes, or if you’re in a rush do a 60 second check. – Check all wheels, seat post and other quick releases to make sure they’re locked. – Squeeze the levers checking the wheels are completely stopping. – Do they need inflating? Squeeze the wall of the tyre with your thumb to check they don’t give. – Check for any cuts in the tread and side wall by spinning each wheel slowly.Are your wheels true? Spin each wheel checking for brake clearance and side to side wobble. – Check the grips are secure and in good condition, and the handlebar ends and any extensions are plugged and tightened. – Lift the front wheel off the ground by 10cm and let it bounce, whilst checking to see if anything sounds, feels or looks loose. 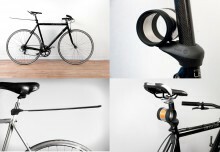 – Do a quick visual and inspection of the whole bike for any loose parts or accessories. The M-Check is a much more comprehensive check for your bike, and its a really useful tool for someone looking to maintain a bike themselves. Tyre pressure – Inflate your tyres to the pressure recommended on the tyre wall (usually in BAR or PSI). Hub bearings – Grip the wheel rim and lock back and forth to feel for loose bearings; spin the wheel to check for over-tight bearings. Rims and spokes – Check the rim surface is flat or not concave, with no visual hairline cracks. Run your fingers through the spokes checking they are tight and spin the wheel to check it runs true. Brakes – Check the angle of your levers and make sure they’re comfortably reached. Brake blocks – Check they’re positioned correctly on the rim and not worn beyond the wear indicators. Brake cables – Cables aren’t frayed or heavily corroded. Brake levers – Squeeze the leers and push the bike forwards to check it stops. Handlebar alignment – Hold the front tyre between your knees and turn gently to ensure that the handlebar stem is correctly aligned with the front wheel and tightened. If the bars move without the wheel the stem will need tightening. Headset bearings – Apply the brakes and rock the bike back and forth to feel for loose headset bearings. Check for hairline cracks in the frame at the joins. Never ride a bike with a cracked frame, no matter how small the crack – take the bike into your local bike shops for advice and a second opinion. Check the cranks (arms that the pedals attach onto) and wiggle from side to side checking for any movement. Spin your pedals checking they’re in good condition. Check the chain is clean, lubricated and it’s not rusting. Hold the saddle firmly and try to rock it in different directions ensuring its fitted securely, is straight and level. Ensure the rear deraileur is straight and doesn’t interfere with the spokes. Inspect back brakes and wheels as with the front. Lights, mudguards, racks, bike components and any accessories should all be firmly attached and not interfere with any other moving parts.